www.pchonlinesurveys.com – PCH Online Surveys. A Survey Program with great rewards! I know that some of my readers are huge fan of Publishers Clearing House Online Superprize and Lotto Sweeps. But did you know guys that PCH have their own Survey Program where you can register and earn reward points just by completing some short surveys online. You only have to indicate your preferences and opinions on different types of things. Asking yourself this is great but what can we get with those reward points? Well by completing those surveys you will be rewarded with points that can be redeem into gift cards to popular Internet shopping retailers. Opinions are important for businesses! Get started today! Opinions are important for businesses and getting the feedback of customers is a big part of a efficient marketing strategy. By doing online surveys you, as a customer and a panelist contribute to the improvement of a company in regards of the quality of their product and service. It’s always a win win situation. Where as the panelist you can say what you like and what you don’t. You can be well rewarded just by voicing your opinions. Get started today! Signing up is really easy. 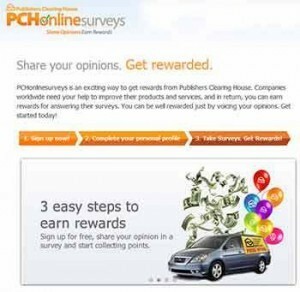 Just vist www.pchonlinesurveys.com – PCH Online Surveys and follow the on-screen instruction to register. You can start today earning points that you can redeem for great products. PCH survey asks questions about the internet, products, and satisfaction of customer service. Some surveys I have to purchase something or just leave a comment. If I win I don’t know what I would do to be perfectly honest. I know I would be one totally surprised, happy beyond explaination. I would be on top like a fire work. “Hope is the thing with feathers / That perches in the Breast . . .” and so forth, and so I continue to hope that one day my number and name will come up and I can help my children, especially a little family that must move, and several charities and churches that mean a great deal to me for the good they do. I would pay off all my BILL like pay off my house, Help my Grand Children that there Mother and Father Get kill,That’s what I would do When I WIN Help my Family and help other peoples that need help other family member’s. First thing I would do is give a large sum to ST.’s Jude’s cancer Hospital for Children. Help my family, take family and friends on a trip. Pay bills off, by new home. Pay for college for all family children, put a fund in all there names. if I win something I will pay my bills and by a home nd go to vacation this year for my birthday nd save money for an emergency only. Winning a million dollars for me, means that I could and would give a gift to the church. I would be able to buy a home so my nephew, my niece’s, my grandson, my son and myself to live in rent free. To not have to worry about if you have a place to lay my head from mouth to mouth would be a blessing. The kids are over again this week, I have three of the four, my babies my grandson will be over Friday night for his week to stay with us. I’m so excited, Thank You , Prize Patrol, It’s me, Elaina. When I didn’t win my problem said the same, I’m still broke, hungry, in need of a home to keep all the kids together, so yes I think it may contain information from me pass comments, thank you very much, because I’m not going to lie so it looks good on paper. Winning a million dollars for me, means that I could and would give a gift to the church. I would be able to buy a home so my nephew, my niece’s, my grandson, my son and myself to live in rent free. To not have to worry about if you have a place to lay my head from mouth to mouth would be a blessing. The kids are over again this week, I have three of the four, my babies my grandson will be over Friday night for his week to stay with us. I’m so excited, Thank You , Prize Patrol, It’s me, Elaina. First Thing I WOULD Do If I Won Is Pay Off All My Bills,And I Would Help My Kid,s Out So They Won,t Have To Struggle As I Have.I Would Also Help Some Needy Families Out. First i would thank GOD for the good fortune and then i would pay off all my bills and then all the debts of my children and grandchildren,after that i would start a list of needy friends and so on. Support the shelter for abused women and children. There are so many people in need.I keep trying to help. First thing I would do is visit my dad he is bedridden since 2012. I wold try to find a home care person for him cause he lives in Puerto Rico and I live in Florida. He is 83 , never wanted to come live in Fl. Now I am homeless so I would buy a townhouse I have 3 daughters and I stay with one then the orther, it’s not the same as if I had my own place. I would also help my children with there bills. Help with my grandchildren collage fees. I have 7 grandchildren . With the rest I would put in the bank. I am so Very DISHEARTENED! I was reading on PCh. let me back up. I had an extremely bad fall and hit my head so hard on cement falling from the top step, I was knocked out cold. I spent time in hospital for this and upon coming home and settling down into my new life of all things are possible…. I read PCH. Now you have to understand that it took me time to get to this point and I have so much left to yet accomplish. I wish to tell you that my job is a dream for me in all rolled up by Grace and being primed my whole life. I CHOSE to GIVE…. I love to help and see smiles for payment so to speak…. just to know that you for one moment however insignificant to many really helped someone that could smile for a moment and that is truly my calling. NO MATTER HOW LIFE HAS BEEN OR WHAT I HAVE BEEN BORN NOT OR IN PART OF…. DOES NOT MATTER. I HAVE A FATHER THAT LOVES ME AND A MOTHER THAT BROUGHT ME UP IN THE WAY THAT WAS BECOMING OF A LADY….C MY FATHERS EXPECTATION OF ME….. IN THAT TO SUCEED AT ANYTHING …. I DO NOT KNOW WHAT FAILING IS AS NO MATTER WHAT I DO OR HOW HARD SOMETHING IS I CAN AND DO OVERCOME….. I AM A PHILANTHROPIST. I GET TO HELP THOSE THAT ARE HAVING A HARDER THAN USUAL TIME. NOW UNDERSTAND THIS. I AM A PERSON THAT HAS NOT SETTLED FOR ANYTHING, IN FACT IT TAKES MONEY TO DO THIS JOB. WHAT COMES TO MIND IS WHAT MY BEST KINDRED SPIRITED MATE CALLS ME…. MATE BEING KINDRED FRIEND OF FRIENDS…… I AM AN ENIGMA…..
NOW THIS IS NOT THE FIRST TIME I HAVE BEEN CALLED THIS. AND I AM CERTAIN WILL NOT BE THE LAST. I am an E N I G M A to most and to others… I am a Lady on a mission. To make this world a little better than when I FOUND IT !!!!!!! or Rather than when I was born? okay so I am reading this poll taken and it takes me several times to read as I am having problems with this at present. SO imagine how hard I am trying to put my words down when you know how to do this….. would it be like looking at a foreign language to you? If you could not put words into association with meanings? Well I am struggling with this and only recently do I feel up to playing pch as it frustrates me. So I Hope you can also realize how hard I am having with this….. I am a person needing help right? I have a brain injury which is causing cognitive problems amongst other things. #PCHELITETEAM #pchElitePatrolteam attn: #PCHELITEPATROL Please do not copy that as it is only hoping they see this…..
Now I have always listened to a brilliant man, my father and my mother says I am too much like him which I consider one of the greatest compliments of my life. I prefer to help others. My father taught me that”Some things must never be forgotten” and he is right. I will post more about that soon. I look to him in so much, one thing is my daddy… yes I am a daddies girl… NEVER EVER let me down in life until recently and still as he has never let me down I think it is a pass as someone may not have told him the truth. Always a liar in the mix! HATE LIARS! But that is where I am going with this…. SO PLEASE STAY WITH MY MIND AS I TRY AND ARTICULATE TO YOU why I am so deeply and utterly disturbed! I read on this blog about PCH what would you do if…..? I read that Most self serving people were inclined to do things for themselves first. FIRST THING, down the line was help and donate to a church? and 4 % polled…. 4%!!!!!! SAID HELP OTHERS!!!! WELL I AM NOT HERE TO CLAIM NUMBERS AND ASK FOR A THING OTHER THAN TO MAKE YOU ALL THINK AND ASK… WHY DID GOD ALLOW YOU TO BE ON THIS EARTH???? IF YOU BELIEVE IN GOD THEN DO YOU NOT HAVE A DIVINE ORDER TO ANSWER TO? AND IF YOU DON’T, WELL THEN BE GLAD I AM LOOKING AT YOU WHEN I SPEAK. YOUR WHO I WISH TO HELP IN ANY EVENT AS IT IS PART OF THE ORDER WHICH I HOLD DEAR. YOU CAN INSULT ME ALL YOU WISH BUT WHEN I AM RIGHTEOUSLY ANGERED…. BEWARE. TO SAY THAT I AM ONE OF 4% POLLED IS NOT ONLY A DISGRACE TO ALL OR YOU OUT THERE THAT COULD REALLY MAKE A DIFFERENCE. IF EVERY PERSON DONATED 1 BOTTLE OF WATER, A CAN OF FOOD, FRESH PRODUCE, AY AND ORANGE OR GOOD GREENS, AND ONE OTHER SUNDRY. SUNDRIES ARE SOAP, TP, THINGS ALL OF YOU LOVE TO HAVE AND I PRAY WOULD GIVE TO HELP JUST FOR A MOMENT….. ANOTHER? IF YOU DID THIS EVERY MONTH…… EVERYONE, DO YOU KNOW THAT WE COULD END WORLD HUNGER, COME TOGETHER AND NOT LEAVE IT TO WHAT WAS ONLY MADE OUT OF AN IMMEDIATE NEED IN THE DEPRESSION ERA….. IT WAS TEMPORARY AND PEOPLE PLAYING THESE GAMES USE IT AS A CRUTCH TO GET BY… POOR THEM…. WHILE THEY PAY FOR INTERNET AND TELEVISION AND HELP GET TO BE A STAPLE OF THE SOFA! I WILL NOT LIVE ON WELFARE…. I WILL NOT AND NEVER WILL ……….. I WILL HELP OTHERS AND TELL YOU… IF YOU DONATED AS SUCH AND WE ALL CAME TOGETHER FOR A COMMON CAUSE DO YOU NOT THINK OUR FATHER WOULD BE HAPPIER? DO YOU THINK WE WOULD HAVE BEEN SO HORRIBLE TO HAVE TORTURED THE EARTH AND OUR LORD THE WAY WE HAVE? HAVE YOU EVER THROWN A PLASTIC THING OUT THE WINDOW? YOUR GUILTY…. ! HAVE YOU EVER KILLED FOR SPORT? YOUR GUILTY, HAVE YOU EVER SMOKED AND POSSIBLY WONDERED IF IF WOULD BE A FIRE? YOUR GUILTY! EVER NOT FED YOUR PET BUT HAD A DRINK? YOUR GUILTY! NOT THOUGHT ABOUT THE GOOD BOOK WHEN IT SITS IN FRONT OF YOU? YOUR GUILTY! BEEN A PART OF SOMETHING UNCLEAN BEFORE THE LORD? YOUR GUILTY! DRIVEN PASSED A PERSON THAT IS IN NEED? YOUR GUILTY! BOUGHT FOR YOURSELF AND NOT DONATED TO THE MAN IN A PAGAN RED SUIT? FOR CHARITY? YOUR GUILTY! GIVEN TO THE MAN IN PAGAN SAID SUIT? Chances are it was to ease your guilt perhaps for not donating to help others even a can???? YOUR GUILTY! SWORE? GUILTY! I SAY THIS NOT TO UPSET OR RUFFLE THE PROVERBIAL FEATHERS SO TO SPEAK….. But to say look, all it takes is a simple act of kindness….. a single act and we could all be of use to help another… to listen to the needs of many needs for the many to LISTEN…. not to be self-serving! and this is what kills me the most! why would I be part of 4 % polled when that is the FIRST AFTER GIVING THANKS to do???!!!!!? and so since I have been preaching now for so long, I ask you all to unite and make it a mission to make it 100% or at least high 90’s that would do something for others. Personally I would and have plans for hydroponics… to Get anyone behind it is like pulling teeth!!! I am finally at my end. I am going thru life changing and altering real issues and need help and if I can sit here to help you make a difference… great…..! But its on you if you do not. You know that old saying… you can drag a horse to water? well time to say I drink that or I don’t …. after all everyone needs water. Right now I have 17 children starving in africa, a SON with the heart of a lion and a prayer angel in Africa, I have children in military and it kills ME! MOTHER…. to so many that they could die and I would never see who I birthed again…. all due to stupidity…. I can drag a horse to water… again…. but ultimately, I help all children who have ever come to me… my birth children… all use to say, “if there is a stranded or hungry animal or person within a 100 miles of our momma they will find her or she will find them”! I was and AM proud to wear that label. I want to share that label with YOU! So please make a difference. I paid not one penny here but I am here… I paid not one penny to play pch and I get nothing from welfare… Infact I have disability which pays for my medical needs and not all. I have that as it allows me to do things as such… I have no car but would walk all the way off this mountain if I was asked to help someone….. I would go all the way for my family and they could not even look at me as they listen to a liar…. but were I millions… would they? Probably…. well I have my own things to keep quiet about just like you… but I use every penny I will ever own to help others. TO make this LIFE COUNT FOR MORE THAN A NEW HANDBAG OR HOUSE! Please I implore you…. PCH GIVE ME IT ALL! I want to winitall! EVERY THING I HAVE EVER ENTERED AND BEEN CONFIRMED FOR ….. EVERY LITTLE PENNY, THE BIG BUCKS.. BIG CHECK EVERY GATEWAY AND SWEEPSTAKES… I WANT IT ALL TO GIVE! PCH ELITE PATROL I HAVE HAD YOU ON YOUR WAY TO DELIVER SO MANY TIMES IN LAST YEAR.. THIS IS IT! I AM MAKING A DIFFERENCE TODAY AND SAY #PCHGIVEMETHEBUCKS! I WANT TO WIN IT ALL AND RECALL ALL THAT WAS AN INTENT OT DISPERSE TO ME AN ‘INTENT TO DEPOSIT OF 10 MILLION’ ET AL SO I CAN SHOW ALL WHAT LIVING FOR LOVE IS!!!!! I DONT LIKE MONEY BUT I LOVE WHAT IT DOES TO HELP OTHERS…. I DON’T OWN A CAR BUT IT COULD TAKE ME A LONG WAY TO SAY IM HERE TO HELP YOUR NEEDS OUT TO LUCKY PPL THAT NEED IT… I AM HERE TO DO THE HYDROPONICS PROJECT! LETS GO! FEED THE HUNGRY! I WAS HUNGRY AND MY LORD FED ME… WHY WOULD I NOT HELP OTHERS????? PPL WAKE UP! THIS IS A GIFT AND IT IS NOW… WHY DO YOU THINK THE PRESENT IS A GIFT? GEEZ, I MEAN REALLY? YOU LIVE AND BREATHE, GROW FAT AND SASSY, FORGETTING OTHERS STARVE AND DO NOT TAKE FOR GRANTED. NOT ONE CALL THIS MOTHERS DAY BUT FROM THOSE I LOVE…. ? ONLY EVERYONE ELSE? THAT IS HORRIBLE AND THEY SHOULD BE PUT TO SHAME… AND SO I AM RIGHT…. AND ANGERED! YOU BETCHA! #PCH ELITE PRIZE PATROL: I WANT TO WIN IT ALL! THANK YOU…. I HAVE ALREADY WON THE RUNNING LOTTO AND IT NEVER CAME… I CLAIM EVERYTHING TO ME NOW… AND ASK HUMBLY TO PRESENT IT TO ME YOURSELVES SHOW I CAN THANK YOU FOR MAKING MY DREAM COME TRUE. #PCHPRIZEPATROLELITE SOME THINGS SIMPLY CANNOT BE FORGOTTEN, AND THEY MUST NOT! BY LadyAlegriaGrace…. and father. I would visit my son and his fiance in Green Bay. I would pay all my bills first. Then I would buy a brand new car. And more of everything. I would be blessed to win so my baby s and I will have a better life far as finances situations . I hope I win then I can pay off my bills and help my children. Most of all help my grandchildren. Then maybe work less hours since its getting harder each day with my medical conditions and enjoy life a little. There are a few charities I would like to give money to also. Then I have a very special lady who raised me and I would like to send her on a vacation of her choice as my way of saying Thank You. Thanks PCH for this opportunity!! I have brought a lot of stuff from them and did every contest what more they want did the search and am still not on the June 30th its a joke all am trying to do is win to get me and my family out of debts. If I became a big winner with PCH I would first take care of my family and since Anchorage Alaska has a large homeless population including teens and adults I would make donations to the different groups that are taxed with trying to feed and find shelter for the homeless population in Anchorage. It would make every American sick to your stomach to see homeless youth and adults living outside when it is 20 below zero outside and our winters are six months long. I Hope you allow me to become better off than today’s world that I am trying to live in. With much better odds of winning thank you. Matt J.
I truliy belive that i can win it all this, time and that dreams do come treu and last year i did it bouth lotto and the mega jakpot at pch . And u now all my life i have dreamd that i won the lottory so thank u all for this life chaging prizeI would like ti confirm that i want ro claim and secure all my fort voming siper prize to a full elijibility and ownershpwin it all a $5,OOO.OO A Week “Forever” prize and leave a lasting legacy for the Florez family!PCHOh1OO3 $1,OOO,OOO.OO MUST soon be awarded from Giveaway No. 3577! For some unknown reason, my completed entry forms for this contest are not being accepted by PCH, and there seems to be no way to contact them for assistance. much better than I was those seven years ago!! I am now so happy to wake up every morning!! PCH knw that I wanna wanna Winnnnnnnnnnn!!!!!!!!!!!!! I have been entering since 2009, because I have always had to work. 2 jobs for the last 1 1/2 I have been playing everything you have to offer, I never win the instant games but I continue to play, hoping and with Faith say my day of Favor is coming , confirmed be three pastors that this is my month for favor. I will share my winnings because that is the type of person I am. God Bless and be Safe when you go out on the road! i CANT THANK YOU ENOUGH, PCH, GOD BLESS YOU, AND PRAISE THE LORD i BELIEVE I WILL WIN. THANK YOU JESUS. My church and my children then think of myself. you guys really made a believer out of me when i first won $100 dollars it was’nt much but you convinced me that people do win i’m ready to win more! Surveys are a reciprocal You provide valuable responses You are rewarded for your effort A win win Nothing can be better than a reward from PCH Try it you will LIKE IT! There appears to be two schools off design old school& new school – the familiar the unfamiliar More attention should be given to mobile tablet or smartphone that’s where the response will be rendered increasingly Generic information should be commiserate with the length of the relationship This is applicable to time as well PS Although you might be a senior citizen your lifestyle should be explored There is gold in those hills! I’m trying so hard to win . That I search day and night . I’m disable and I live in a camper, It would be nice to buy a home for me and my dog max.It would be nice to have Christmas at my home with my boys and grand kids. I’m trying so hard to win . That I search day and night . 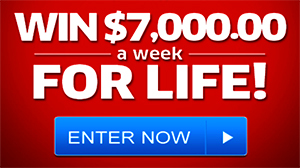 The only prize that matters to me is $7,000.00 a week for life super prize. I just hope that I win so I can have a home, car and yes to meet the PRIZE PATROL. some of them are just to long.